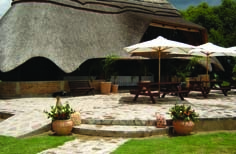 Hideaway is a self-catering facility, however catered options are available on request for groups. Please specify your preference when making your booking. We offer simple, delicious, home cooked menus tailored to your budget and tastes. 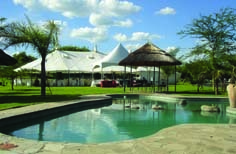 We have a big entertainment area, free for use for guests of the River Lodges, Tented Lodges and Honeymoon Suite. We do not stock soft drinks, alcohol and ice so guests must bring their own. Take time to have a refreshing drink while sitting around our swimming pool, or dive in to cool off on a hot summer day. Television sets are available upon request. Each lodge is equipped with DSTV fittings. Please bring your own decoder and smart card. 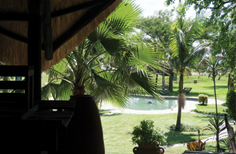 The self-catering lodges and main kitchen have gas facilities. Should power be lost during your stay, we have a generator that will be on specific times. You are welcome to bring your own diesel and use our generator free of charge at extra times. Borehole water is available and safe for consumption. We have braai stands (both stationery and mobile) available for your use. Firewood is available for sale. Please advise reception if you wish to have a braai so they can assist with set up. We have an electric fence around the entire perimeter of the lodge, as well as security guards on duty throughout the day and night. We pride ourselves on personal service, with our friendly staff on hand to provide any assistance you require during your stay. © Hideaway Fishing Camp 2014. All Rights Reserved.